The land for this cemetery was donated in 1897 by Joseph Vopova. The people buried here came mostly from Bohemia and Moravia and were Freethinkers. There is a statue of Johann Hus, honoring the Bohemian religious reformer who was executed in 1415. Some of the gravesites are covered with beautiful mosaic blankets made with tiny colored stones (see photo at left). Located about a mile south of Highlandville on County Road A26, east of the Big Canoe Lutheran Church and cemetery. This log school was built by Martin Bouska in 1853 about one mile east of Spillville. He was one of the first Czech schoolteachers in America. 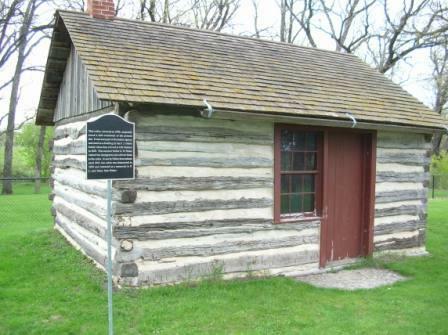 He taught in the left side of the log building and his family lived in the right side 1853-1866. Martin and wife Katrina were among the first 20 Czech settlers in the Spillville area. The building was restored in 1994 and moved to the Bily Brothers Clock Museum campus. 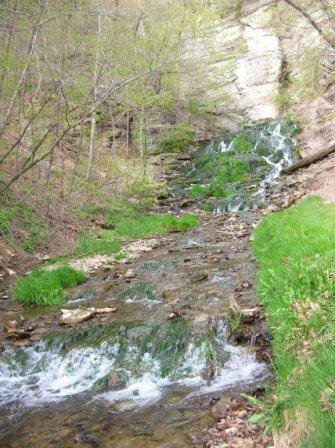 Dunning's Spring, a city park in Decorah, is the site of the first mill built in the county seat. A boulder near the stream marks the spot where William Painter built a grist mill in 1849. By 1861, E.C. Dunning owned the property and replaced the original mill. Usage changed through the years. The structure was torn down in 1897. This log cabin was once located on the Indian Agency at Old Mission. It was located about 1 mile south of its present location at the site of the St. Anthony of Padua church. The F.J. Huber family lived in it when they arrived in Winneshiek County ca 1849. The building had at one time been used as a post office and is considered one of the oldest buildings in Winneshiek County. This frame board and batton barn has a dressed stone foundation with an enclosed ramp on the north elevation. The first owner of the property where the barn is located was Joren Brunvold from Nesbyen, Hallingdal, Norway. It is believed that he came to Winneshiek County in 1848. The barn is located on private property in Highlandville Twp. 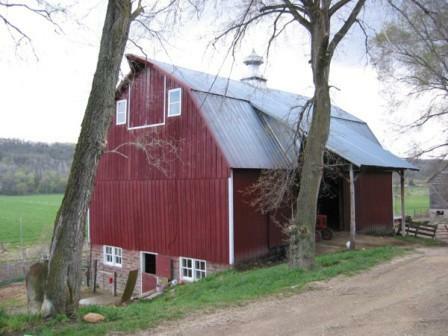 This barn is one of 14 octagon barns, built in the 1800s, still known to exist on an Iowa farm. The non-self-supporting modified hip roof specifically characterizes it as a Coffin type, most likely influenced by the Webster County barn of Lorenzo S. Coffin. Other identifying features include heavy timber construction, rectangular plan and general-purpose function. Coffin, a stockbreeder and farm editor of the Fort Dodge Messenger, is credited with building the first round barn in Iowa in 1867. Octagon barns were uncommon and considered experimental in their day. The Kinney Barn is located on private property. The Hutchinson farm has been in the family for 100 years. The barn was built in 1929. 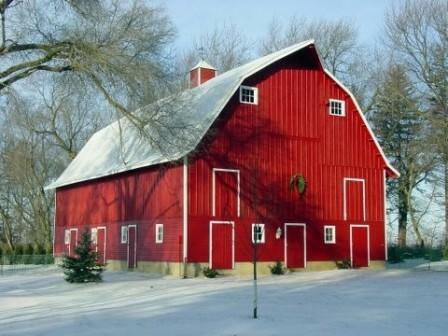 The photo of the barn after restoration was taken by Michael McConnell. Original owners (1855) were Mary and Joseph Puffer. Their son Michael and wife Rose Puffer, built the wooden barn and six surrounding buildings from 1900-1905. The Prague-born Puffers raised Brown Swiss, known for their “rich cream.” Community dances were held in the barn. Sherry Puffer Gribble, great granddaughter of the original owners, and her husband, Dale, meticulously restored the barn and farm. The photo of the barn after restoration was taken by Clair Carolon who painted the barn after restoration was complete, is shown on the right . 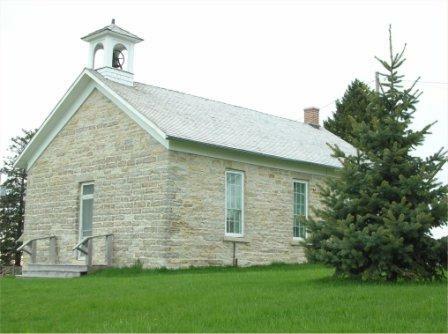 This one-room limestone school, built in 1854, is one of the oldest school buildings in the state. The architecture is typical of early Iowa settlement periods. The school has been restored and is occasionally open to the public. A grist mill was built on Canoe Creek in 1851-52 by G.V. Puntney for Beard and Cutler. The mill stones were shipped by boat from Galena, Ill. to Lansing, Iowa and on to the mill site by boat. In 1893, iron rollers replaced the stone buhrs. 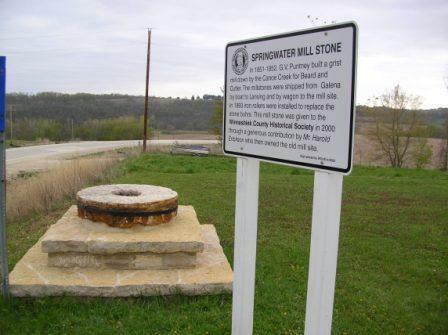 The mill stone above is on display at the Springwater Quaker Cemetery after being donated to the Winneshiek County Historical Society. This church in Spillville was designed and built by Czech settlers in 1860 and is the oldest Czech Catholic church in North America. 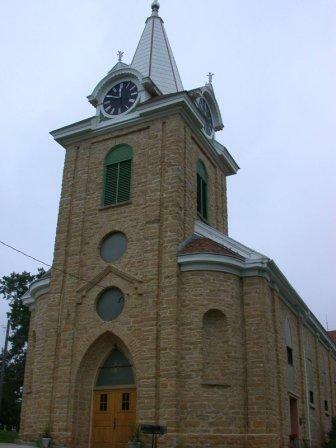 Czech composer Anton Dvorak played the organ at the church when he spent the summer of 1893 in Spillville. Many of the ornate cast iron grave markers in the old part of the cemetery were made by Charles Andera. This stone church represents one of the early Norwegian settlement churches in the county. It began as a branch of the Little Iowa Parish organized by U.V. Koren and Nils Brandt, early pioneer ministers. 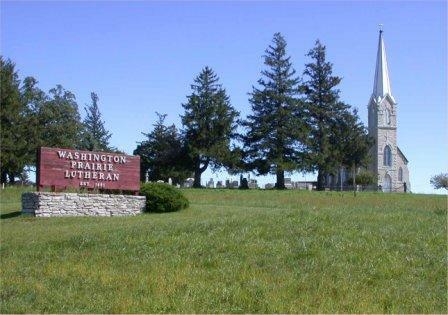 This view from the Washington Prairie Norwegian Methodist Church shows the Washington Prairie Lutheran Church a short distance away to the northeast. 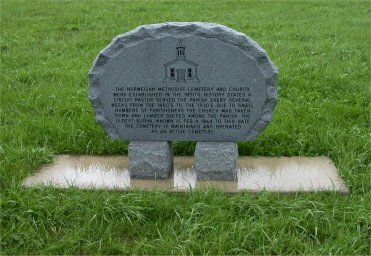 The Washington Prairie Norwegian Methodist church, located on County Road W42, is surrounded on three sides by graves marking the lives of its members. This limestone church, built ca 1865, is considered the mother church of Methodism in Norway. Ole Peter Petersen first established this church and later returned to his native Norway where he established the first Methodist congregation in that country.